Today begins the three-day event for Annual Passholders to experience some of the new and exciting things coming to California Adventure in the upcoming months! 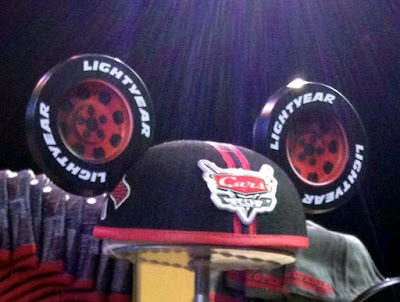 The Merchandise Showcase event was centered on Cars Land and the merchandise that will be available when the land opens June 15th, 2012. The event also had information about Mad T Party as well as new California Adventure themed merchandise. Walking in to Stage 17 (which is located near the back of Hollywood Pictures Backlot) there was a pop-up shop set up in the center of the room. The set up reminded me of the D23 Expo set up. They had all different kinds of Cars Land merchandise for fans of all ages! Ride posters with “Grand Opening” stamped on them were available, as well as matching Ride Poster T-Shirts. I LOVE the way these turned out. They are each unique to their ride and look awesome. I love the details that they put on these T-shirts as well. Not only is the design great but also the little touches are what make it that much more magical. Now back to the Merchandise! 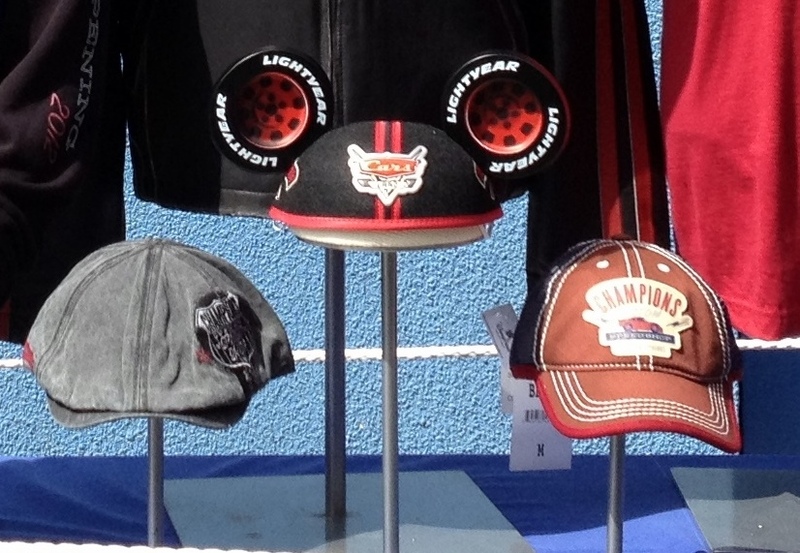 There are plenty of T-shirts, jackets, mugs, plastic cups, key chains, and pins etc that were made for Cars Land. 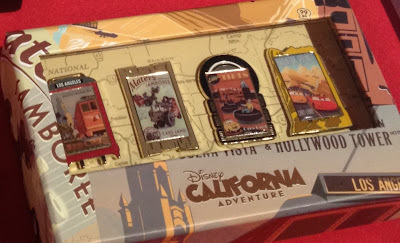 There is a limited edition 1000 pin set of ride posters, as well as a limited edition coin set. Also available early today were the brand new Monorail Cars Vinylmation. They looked awesome in person! The tray comes just like a tray of Vinylmation, you get 24 figures, 2 sets and 1 chaser! I bought one blind box to see how the packaging looked and to see how the quality of the figures would be… and they look great! The box is a bit skinnier compared to our normal Vinylmation blind box, but it works since the design is a Monorail. I love the box design, it reminds me of a ride poster. Now personally I wouldn’t go back and buy more of these, they just aren’t my thing. I like the idea of monorails and I absolutely LOVE all the Cars characters, but this set seems to me like it would appeal more to men/boys. Now maybe if the set were on the Vinylmation mickey mold I would re consider. But the monorails honestly didn’t do much for me! I was thinking how cool it would have been if they made a Lightning McQueen mold, and then put each car onto his mold! Who knows what the future will hold! Check out Destination Vinylmation’s Monorail Cars explained page for more on this set. My favorite thing pertaining to Cars Land (which I bought!) has to be the Piston Cup figurine! I think this is absolutely awesome! It says Grand Opening on the front, and on the back of the Piston Cup it says “Cars Land”. I love that Disney decided to add Cars Land to DCA, the Land is themed perfectly, the merchandise looks awesome, and I can’t wait to actually step foot into Radiator Springs! The Showcase also featured some of the new DCA merchandise that will be available soon. I love the idea behind these designs. The theme is, Mickey and Minnie driving through California and all the different stops they make on their journey. Each stop is represented by a different stamp. Each stamp stands for a different attraction at California Adventure. 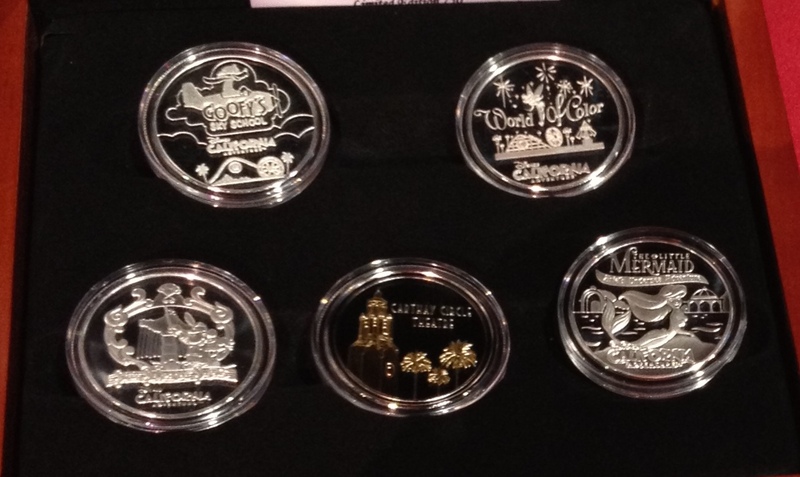 There is a Toy Story Mania Stamp, Little Mermaid Stamp, Cars Land Stamp, and World of Color Stamp etc. I love this idea, the merchandise looks great! This design is available on many different products such as, T-shirts, Jackets, Cups, Shot Glasses, Blankets, Key Chains and more! After walking out of the shop, Mater and Lighting were there for a photo op! Next to Mater and Lightning was a display that showed the new costumes for Cars Land! Lastly there was a display for the Mad T Party, which will be replacing ElecTRONica in June! The merchandise looks AWESOME! The Mad T Party merchandise wont be available until June as well. There are various items like hats, rabbit ears, t-shirts, jackets and ties. Also there will be ‘Mad Treats’ such as, light reflective lollipops, rock candy, bagged candy, and Cheshire cat candy as well as mickey sprinkles! There was an opportunity to purchase some of the new snacks that would be for sale during the T Party such as, dill popcorn (I didn’t try this but everyone that did said it was delicious) and sour apple/cotton candy slushies! Over all I thought the AP Preview was awesome. It was organized, in a big area so everyone could see everything, the merchandise looks awesome and now I am even MORE excited for Cars Land and Buena Vista Street to open on June 15th! !